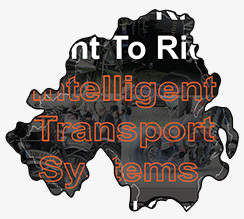 Right To Right has published a document looking at Intelligent Transport Systems – Electronic Vehicle Speed Control – Intelligent Speed Adaption regarding motorcycles. High on the European Road Safety agenda is focus on passive and active Intelligent Transport Systems (ITS) to reduce road casualties. “eSafety brings together the European Commission, industry, public authorities and other stakeholders to accelerate the development, deployment and use of eSafety systems – Intelligent Vehicle Safety Systems – that use information and communication technologies in intelligent solutions, in order to increase road safety and reduce the number of accidents on Europe’s roads”. In June 2008, representatives of Motorcyclist Associations and Government Agencies in Europe actively participated in an International Transport Forum (ITF)/Organisation for Economic Co-operation and Development (OECD) OECD workshop held in Lillehammer, Norway. Amongst the recommendations (priority number fifteen) from the ITF/OECD workshop on motorcycle safety was the recognition that “enhanced awareness of motorcycles should be incorporated into the development of all vehicle ITS projects”. 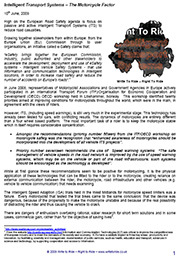 Priority number seventeen recommends the use of Speed warning systems “The safe management of vehicle speeds in the road network is improved by the use of speed warning systems, which may be on the vehicle or part of the road infrastructure; such systems should be encouraged as the technology is developed”. While at first glance these recommendations seem to be positive for motorcycling, it is the physical application of these technologies that can be fitted to the rider or to the motorcycle, creating reliance on external communication between the rider, the motorcycle, road infrastructure and other vehicles (e.g. vehicle to vehicle communication) that needs examining. However, ITS, (including speed warnings), is still very much in the experimental stage. This technology has already been tested for cars, with conflicting results. The dynamics of motorcycles are entirely different than a four wheel based platform. The most important task of a rider is to keep the motorcycle stable which in itself requires considerable concentration. Road accident causation research starting with the Hurt Report (1981), have all identified that the greatest cause of accidents is human behaviour. Appropriate basic rider training with special focus on attitude and risk awareness. 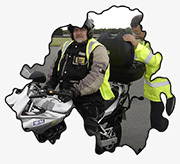 Awareness of motorcycles included in car driver training. Focussing on the human element could be a far more cost effective and longer lasting solution than relying on Intelligent Transport Systems to save lives.